Lake Mohave was created in 1951 following the construction of Davis Dam on the Colorado River southeast of Las Vegas. The 64 mile long reservoir is subject to fluctuating water levels and exchange flows. The upper 20 miles of the reservoir is cold year round due to deep-water releases from Hoover Dam. This section lies within the narrow walls of Black Canyon. The remainder of the reservoir is seasonally warm and more open with the widest section being Cottonwood Basin (4 miles). 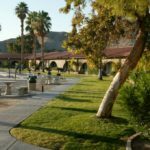 Lake Mohave is located within the Lake Mead Recreational Area and is administered by the National Park Service located in Boulder City. A detailed description of the Lake Mead Recreation Area can be found on the National Park Service web page at nps.gov/lame. The 64-mile long reservoir covers approximately 30,000 surface acres to a maximum depth of 120 feet. There are three marinas with launch ramps, two in Arizona (Willow Beach and Katherine’s Landing) and one in Nevada (Cottonwood Cove). There is also a launch ramp at Princess Cove on the Arizona side near Katharine’s landing. 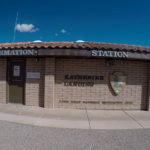 Camping is available at Cottonwood Cove and Katherine’s Landing. Shoreline camping is permitted. Campers should carry out their trash and provide for adequate sanitation. 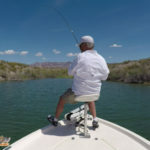 Things to Consider: Summer temperatures can exceed 110° F.
Game fish species include striper, largemouth bass, rainbow trout, bluegill sunfish, crappie, and channel catfish. Nongame fish include carp, razorback sucker, bonytail chub, red shiner and threadfin shad. The best time of the year to fish for striped bass is April through November with the peak in October. For largemouth bass, March through June is generally best and for rainbow trout anytime they are stocked (November through March). Generally, the most productive fishing for striped bass is when sunlight is low or at night. Using cut bait or lures at these times can be very productive as fish move into shallow water to feed. 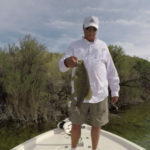 Day fishing requires trolling or still fishing 40 to 100 feet deep with cut bait or with lures that imitate trout or shad. For largemouth bass, plastic worms, live worms and various lures work best during the spawning season. For the trout, prepared bait works best within 3 to 4 days of a plant. 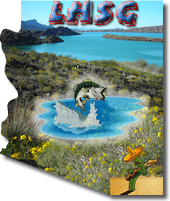 Two state records have come from Lake Mohave; a 63 pound striped bass was caught in 2001 and a 16 lb 4 oz rainbow trout was caught in 1971. 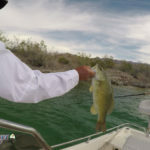 Although not state records, Lake Mohave has also produced a 30-pound 8-ounce carp, an 11-pound largemouth bass, a 26-pound 4-ounce channel catfish, a 2-pound 12-ounce black crappie, a 1-pound 1-ounce bluegill sunfish and an 11-pound 6-ounce cutthroat trout.